According to the US Department of Energy, heating and cooling costs account for nearly 56 percent of home energy costs. With winter breathing down our necks, this is a good time to find out how you can reduce your home heating costs. Weatherproofing your windows can help you reduce your overall costs to heat your home this winter. Here are some energy saving tips to help you save money this winter on heating costs. One solution to help reduce energy costs is to take a look at your current window coverings. Blinds, curtains, awnings and other window coverings may help you keep the cost of heating your home down. While it is true that your window coverings will not reduce your costs dramatically by themselves, they may have an impact on your heating bills. For those who are considering insulating panels, they may help you reduce the amount of heat that is lost through your windows. 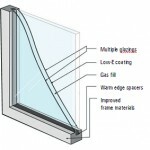 Generally, these panels are designed using foam insulation, they are easy to install and remove and require no hardware. 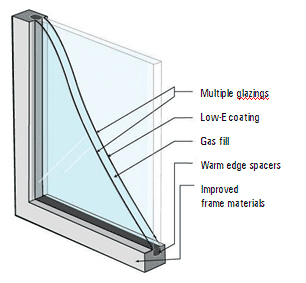 You might be surprised to learn that installing a storm window can reduce heat loss by as much as 50%. While exterior storm windows may have to be custom made, there are kits available at most building supply shops that offer a low cost alternative that may be easily installed from inside the home. Some are crafted from plexiglass and others may be made from shrink wrap. These affordable kits can save you significant money on your winter heating bills. You might be surprised to learn that you can save as much as 10 percent on your energy bills by using draperies properly. While this will vary with the placement of windows as well as the fabric of the draperies, there are some simple things that you can do to help make your home more energy efficient by using the right drapes. The best window coverings are not a substitute for stopping cold air from getting into your home. Weatherization techniques that seal leaks and cracks in doors and windows will be your best line of defense. Caulking and weather stripping can help seal the areas in doors and windows that cause air to flow in and out of your home. Using the right materials will help ensure that your home stays warmer while reducing your overall heating costs. Understanding which materials work best on leaks and cracks will help you determine the best products for your needs. If your windows or doors have cracks or air spots that are less than one quarter of an inch, then caulking can be the right solution. Available in variety of colors including white, beige or clear, caulking is easy to apply and is easy to remove as well. Caulking is made of a number of different materials, someone at your home repair store should be able to assist you in finding the right product for your needs. Some caulking products require a caulk gun while others come in self-applying containers. Available in a variety of materials as well as colors, weatherstripping is perfect for the bottom of your doors as well as for window frames. When purchasing weatherstripping, make sure that you allow additional material for waste. When used on doors, it is important to check weatherstripping, especially if the door is used frequently as it can deteriorate over time and should be replaced as needed. These are just a few of the steps that you can start working on today to save energy over the upcoming winter. Making sure that your windows are properly sealed, using the right materials to cover your windows and keeping your heating system clean can all help you reduce your home energy costs this winter.